Probably the Facebook editors involved are just ignorant. Blaming the algorithm for their own shortcomings is rather pathetic. 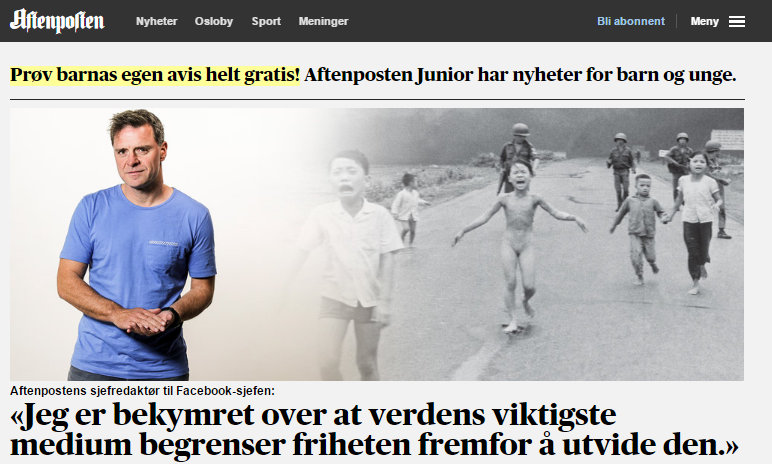 …… The controversy stems from Facebook’s decision to delete a post by Norwegian writer Tom Egeland that featured The Terror of War, a Pulitzer prize-winning photograph by Nick Ut that showed children – including the naked 9-year-old Kim Phúc – running away from a napalm attack during the Vietnam war. Egeland’s post discussed “seven photographs that changed the history of warfare” – a group to which the “napalm girl” image certainly belongs. Egeland was subsequently suspended from Facebook. When Aftenposten reported on the suspension – using the same photograph in its article, which was then shared on the publication’s Facebook page – the newspaper received a message from Facebook asking it to “either remove or pixelize” the photograph. ……. Facebook is a publisher whether it wants to admit it or not. Just the act of censorship makes it a publisher. The world may well be dumbing down since the time of hunter-gatherers. And Facebook probably contributes to accelerating the glorification of stupidity. This entry was posted on September 9, 2016 at 4:20 am and is filed under Behaviour, Media. You can follow any responses to this entry through the RSS 2.0 feed. Both comments and pings are currently closed.